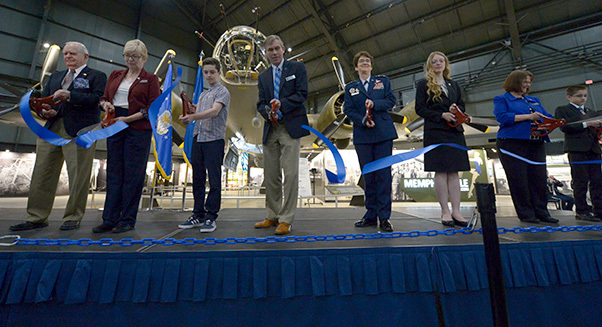 Special guests including National Museum of the U.S. Air Force Director retired Lt. Gen. John L. Hudson and Air Force Director of Staff Lt. Gen. Jacqueline D. Van Ovost cut the ceremonial ribbon for the public opening of the Memphis Belle at the National Museum of the U.S. Air Force, Ohio, May 17, 2018. The Memphis Belle crew completed their 25th mission in Europe exactly 75 years before the ribbon cutting ceremony. The meticulously restored B-17F Memphis Belle – the first U.S. Army Air Forces heavy bomber to make it home to the United States after completing 25 successful combat missions over occupied Europe – was unveiled before hundreds of family members of the Memphis Belle crew and maintainers and invited dignitaries. It is the first time the aircraft has been on public display since 2002. “This is a once-in-a-lifetime opportunity to witness a culmination of thousands of hours of work,” said Lt. Gen. Jacqueline Van Ovost, Air Force director of staff. “This is a tremendous piece of our national history. “Through it all, this aircraft and her crew exemplified the strength and spirit of our nation. 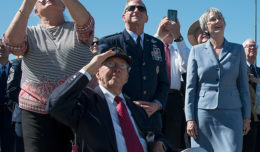 … The men and women who built, maintained and flew the Memphis Belle stepped up to the task when our nation called, despite the odds,” she said. 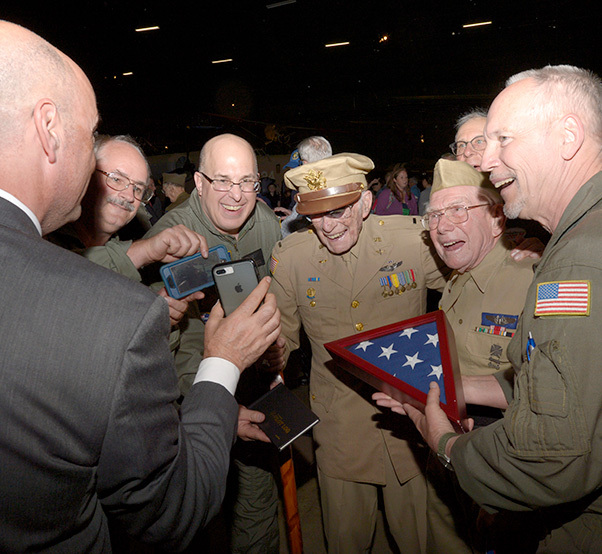 The Cincinnati Warbirds Experimental Aircraft Association Squadron 18 presented a U.S. flag to Herb Heilbrun, a 97-year-old B-17 pilot veteran. The flag was flown on the B-17 Yankee Lady during the formation flyover at the U.S. Air Force Museum, May 16, 2018. “The Memphis Belle is unique – it is a timeless American icon,” said Jeff Duford, museum curator and Memphis Belle project manager. 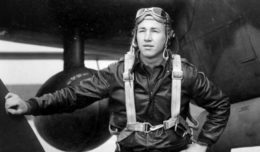 He credited American heavy bomber crews with “playing a critical part in ending the war. They broke the back of the German Air Force which allowed D-Day to happen. “We can never forget what these Airmen did,” he said. The aircraft’s restoration began in 2005, said Lt. Gen. (Ret.) John Hudson, museum director. “The Memphis Belle becomes the B-17F aircraft of record for our United States Air Force,” he said. 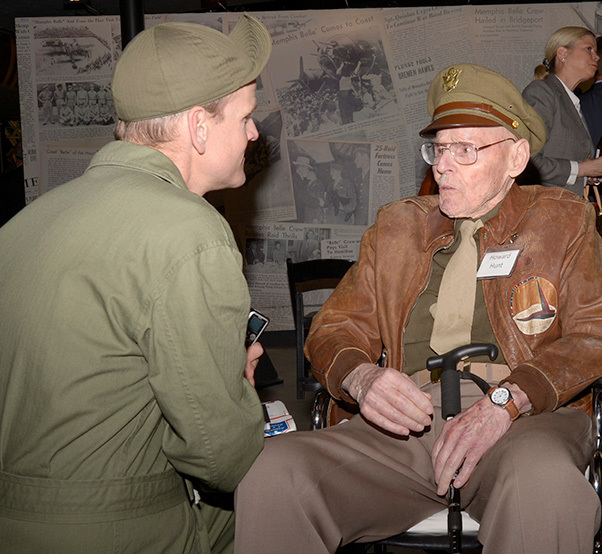 Retired Col. Howard Hunt, a 96-year-old World War II B-17 pilot veteran, talks with a fan during the Memphis Belle private exhibit opening ceremony May 16, 2018, at the National Museum of the U.S. Air Force, Ohio. Hunt piloted the Memphis Belle aircraft during the homecoming and war bond tour in 1943. “This is one of the big reasons why we are here,” Hudson said. Surrounding the aircraft is a new Strategic Bombardment exhibit featuring a digitally animated map of the strategic bombing campaign; two Medals of Honor; items worn and used on significant missions; artifacts from bombing campaign leaders; a bomber top turret and ball turret; and intriguing photos. 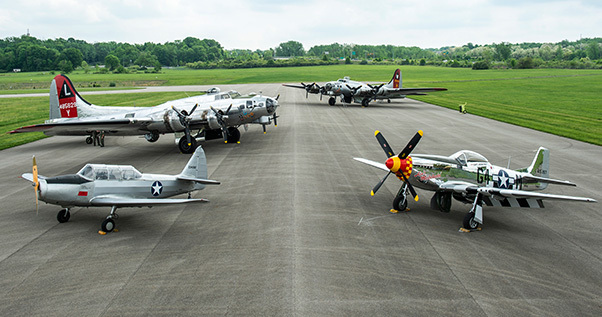 Additional events during the exhibit opening celebration through May 19 include a flyover of World War II-era aircraft, along with more than 160 reenactors and 30 vintage military and civilian vehicles on the museum grounds. On May 17, the public was able to visit the historic aircraft, exactly 75 years after its crew finished their last mission in the war against Nazi Germany on May 17, 1943. The Aluminum Overcast and Yankee Lady, both B-17s, along with the P-51 Ain’t Misbehavin’ and a Heritage trainer are displayed at the National Museum of the U.S. Air Force flight line May 17, 2018. They performed a flyover over the museum during the morning to commemorate the opening of the Memphis Belle. 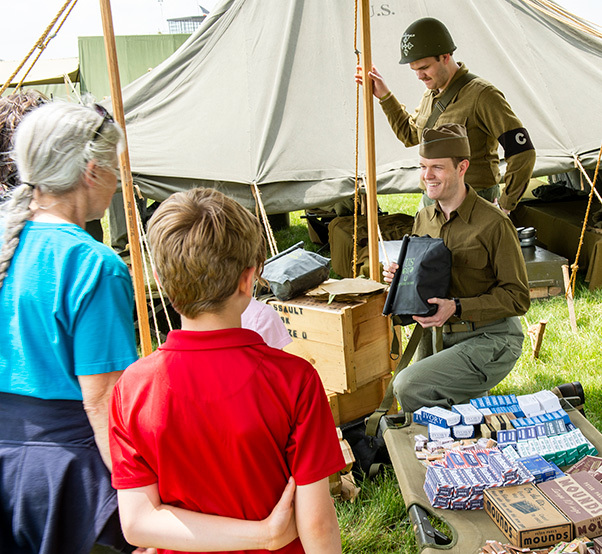 Reenactors show visitors a gas mask and other World War II memorabilia during the Memphis Belle opening ceremony at the National Museum of the U.S. Air Force May 17, 2018. More than 130 reenactors participated in opening events at the museum during the celebration.